I have been truly touched by a fellow artist, Nicole France-Coe, whose work is presently in the Leep Art Gallery at the Postema Center on the Pine Rest campus where I work. Her work is about prayer, and has a sense of whimsical reverence to it. Bright colors, and mixes of photo clippings, beads, paint, stiching and fabric. It is like looking into a visual prayer journal. I love it. It has been a place where I go daily for a sense of visual rest from the pressures of my inpatient psychiatric ward. As I have returned to my art studio, I feel a new sense of life returning to my work. It has been a heavy summer, and as the leaves are beginning to burst into vibrant color here in the woodland around my home, I am sensing God breathing life back into me. I sense God’s graciousness to me. I have not been left in the darkness of my depression which has lingered off and on since January … He has lifted my head. So I am painting again. I have been focussing on tiny, intimate canvasses recently, which I love doing. But I felt a yearning to paint large again. This past summer I purchased two wonderful books on the material culture of China, and have been pouring through the photos of one in particular: Chinese Dress by Valery Garrett. 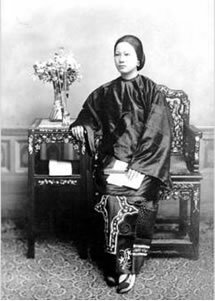 Whereas most books on the material culture of China focus heavily on the dress customs of the Imperial Court, she has a lengthy section on both the dress of women and working-class people. There are some wonderful reproductions of women’s clothing whose detail and coloring moved me profoundly. They remind me of visual graciousness that pair tastefully with my inner sense of God’s movement in my own heart. So I have begun painting a woman on a tall, narrow canvas. She is wearing a pale blue robe and reaching tenderly upward, her head tilted slighly back, reaching towards a dove which is flying above her head. The dove in my sketch is dropping a blossom from a flowering twig, but I have yet to see how God moves me to create this detail in the final painting. The background is gold, but a tarnished, and in places distressed. Yet what draws me into this painting is the face of the woman which to me captures a content and open quality that I so wish for myself. It excites me to create this piece … and I can’t wait to see how it comes out.